I thought this kind of stuff wasn't allowed on Kijiji? I have underwear to sell for any pervs who wnats to have them. $10 per undeerwear.Medium and large. Yep, used men's underwear is a hot search. Something tells me this guy could have got up to $20 if he said they were skidmarked undies or piss-stained briefs. 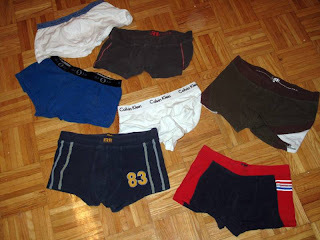 Gosh, maybe I should just stop doing laundry and sell my fat guy underwear on Kijiji.